The spoils from a recent trip to Chinatown. This is the first part of New York Food Journal’s guide to shopping in New York’s diverse ethnic and specialty stores. These stores provide the inspiration and ingredients for many of our recipes. 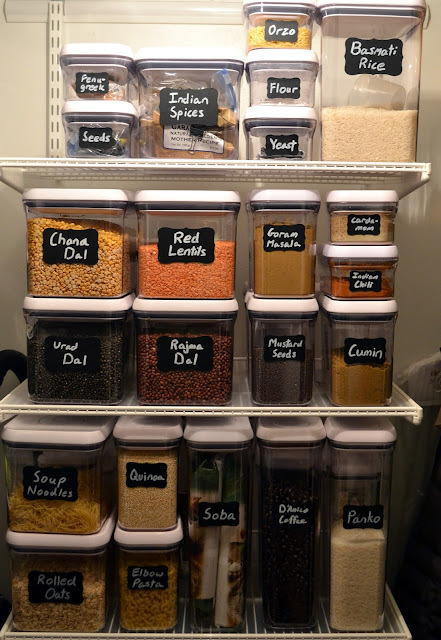 Shopping in them has greatly expanded our range in the kitchen and has provided hours of enjoyment. New York is one of the most ethnically and culturally diverse cities in the world, and one of the most fun, rewarding and delicious experiences one can have here is to explore a neighborhood through its food. As we explore, we will give suggestions on what ingredients to look for and what to do with those ingredients at home. We hope you will find these shopping tours as enjoyable as we do. When you go to Chinatown, it’s always a good idea to start with lunch. Two good options near the beginning of our tour are Ping’s Seafood and Noodle Village. Ping’s serves delicious dim sum, rolled to your table in carts. 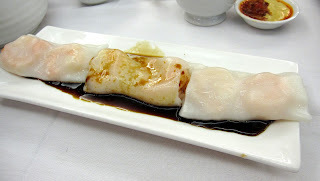 I am particularly fond of the steamed rice noodle with baby shrimp, which consists of shrimp rolled in a single large noodle and topped with a sweet and savory sauce. Noodle Village serves excellent congee, soups and Hong Kong style lo mein, which are homemade noodles served with your choice of toppings and a clear broth for sipping or mixing into the noodles (not to be confused with American-style lo mein). Both are great options for a satisfying and inexpensive lunch before embarking on your shopping excursion. Our tour begins on Mosco Street, a tiny alleyway that runs one block between Mott Street and Mulberry. In the center of the block is the unassuming . 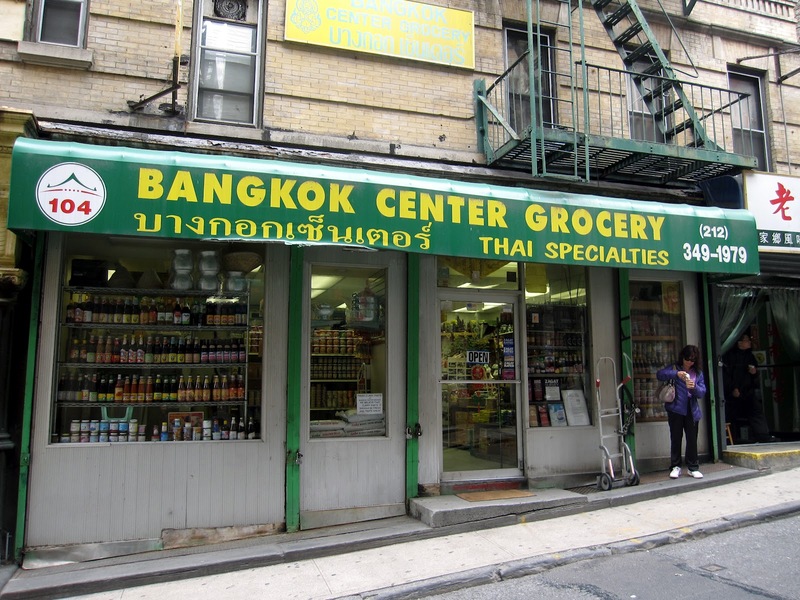 . .
Affectionately known in my family as “the Thai Store”, Bangkok Center Grocery may well be the best ethnic store in New York City. It has everything you need to make any Thai or other Southeast Asian dish, from kaffir lime leaves and fresh Thai basil to curry paste and fish sauce. Few items cost more than a couple dollars. But what separates this store from the rest is the unparalleled shopping experience. The staff is as helpful as possible without being pushy or overbearing. They leave you alone to browse but are always available to help with a smile. Best of all, they are happy to advise on cooking. Simply tell them what you would like to make, and they’ll tell you what ingredients you will need and how to keep them fresh. (“Want to make pad thai?” he asked me on my first visit, holding up a block of tamarind and a package of bahn pho noodles. “How about green curry? Let me show you the fresh curry paste.”) The fresh ingredients and terrific service have me returning to this store again and again. 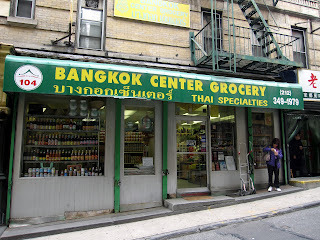 Info: Bangkok Center Grocery, 104 Mosco Street, (212) 349-1979. Hours: Mon, Wed-Sun: 10 am – 8 pm; Tues: 10 am – 6 pm. 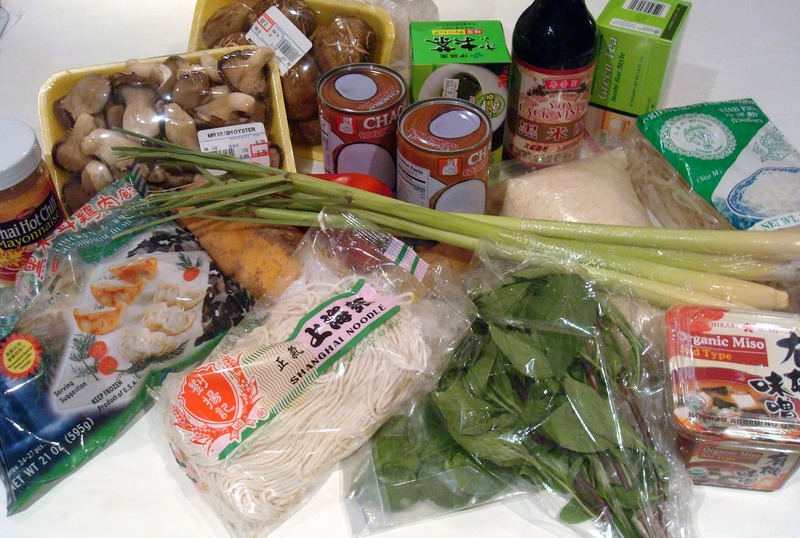 What to buy: thai basil; lemongrass; kaffir lime leaves; thai chilies; curry paste; palm sugar; coconut milk; fish sauce, oyster sauce and other condiments; bahn pho and other noodles; rice paper wraps. What to make: Thai coconut milk soup (tom kha gai); phở ga; Vietnamese summer rolls. Once you have loaded up on Thai ingredients, take a few paces west, turn right up Mulberry Street and walk north three and a half blocks. On your left, you will find . . .
Tokyo Mart is a good source for any Japanese cooking needs. Shelves are packed with all different kinds of seaweed, sushi rice, noodles, tea and Asian condiments. There is also a decent selection of Japanese and other Asian plates, chopsticks and serving dishes. At the front, there is a counter where fresh sushi is prepared. Unlike at the Thai Store, service here is nonexistent. But it serves its purpose. 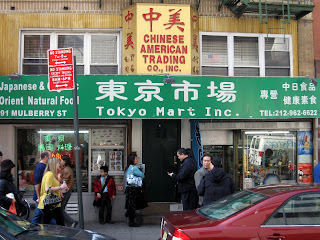 Info: Tokyo Mart, 91 Mulberry Street, (212) 962-6622. Hours: Daily, 9 am – 8 pm. What to buy: kombu, nori and other seaweed; bonito flakes; togarashi spice mix; noodles; tea; Japanese snacks; asian plates; fresh sushi. What to make: miso soup and dashi. Take a left out of Tokyo Mart, walk up to the corner and make another left on Canal. One block ahead, on the far-left corner is the always satisfying . . . I have been frequenting this reliable spot for years for their freshly-baked Chinese pastries. Red bean buns come out warm, crisp yet doughy on the outside and sweet-but-not-too-sweet on the inside. The cheese twists, which are my personal favorite, taste like freshly baked croissants and make for a great breakfast. Most pastries will keep for the better part of a week in the fridge; just heat them up for a few minutes in the toaster oven. The service is a little strange: you feel a bit rushed as an attendant grabs pastries for you from the bins on the wall. But it’s all part of the experience. 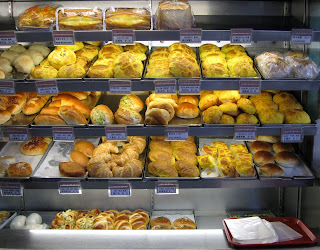 The goods are delicious and cheap (about $1 or less per pastry), and that will keep me coming back for a long time. Info: Dragon Land Bakery, 125 Walker Street, (212) 219-2012. Hours: Mon – Fri, 7 am – 8 pm; Sat – Sun, 7:30 am – 8 pm. What to buy: red bean buns; cheese twists; coconut buns; pork buns; sesame balls; any other Chinese pastry. Once you have had your fill of pastries, head east on Canal, walk a block north through Little Italy on Mulberry Street (stopping for a cannoli and cappuccino at La Bella Ferrara), and take a right on Hester Street. Two blocks ahead on your left is the sprawling, two-story . . .
One of my favorite stores in the city, Hong Kong Supermarket is a sprawling temple to Chinese and other Asian foods. The produce is fresh and cheap (try the purple yams, which are life changing, and the shockingly cheap shiitake mushrooms). At the fish counter, patrons clamor over the live ones still swimming in their tanks. Rows and rows of Chinese condiments line the aisles, with more kinds of soy sauce than you knew existed. An ample freezer section contains dumplings and other dim sum, which can be steamed and eaten at home. There are even samples given out, which I appreciate, so you can snack a bit while you shop. The lower level has a selection of plates and cooking equipment. 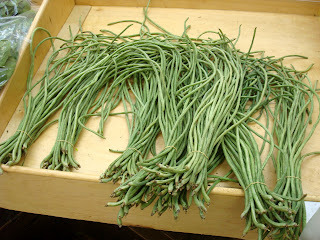 Info: Hong Kong Supermarket, 157 Hester Street, (212) 966-4943. Hours: Daily, 8 am – 8 pm. What to buy: fresh produce (including long beans and purple yams); mushrooms; fresh fish; Asian condiments; shaoxing rice wine; fresh and dried noodles; dumplings; tea. 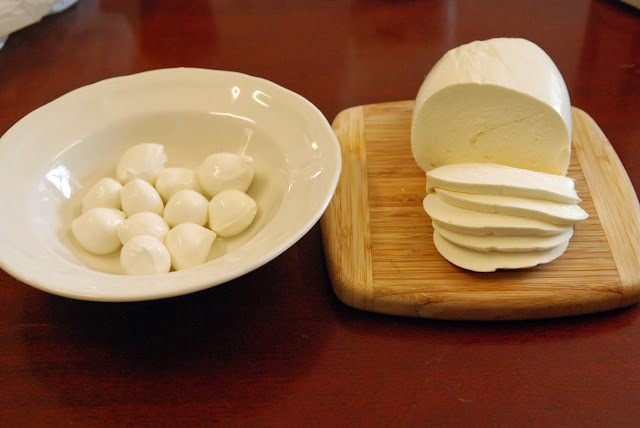 What to make: fried rice; stir-fried Shanghai noodles; pork and chive dumplings; ma po tofu. With your shopping bags full, head home and prepare some New York Food Journal recipes for yourself and your friends. 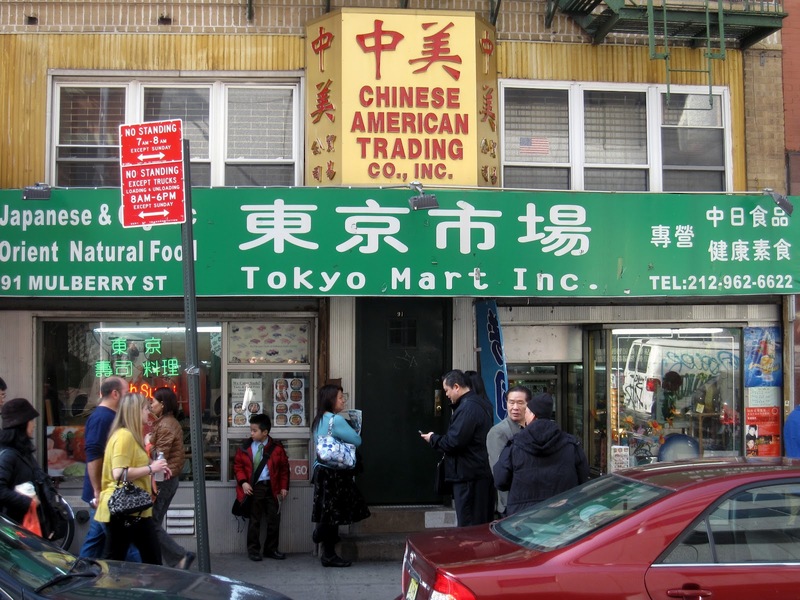 If you have a favorite store in Chinatown that we overlooked, please contact us with your suggestions.